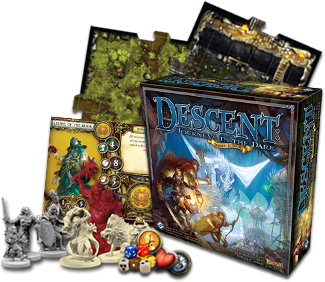 Descent: Journeys in the Dark- Second Ed. Okay, fair warning: Descent has stood the test of time and is probably my favourite game. I mean, I just love this freaking game. (Although Lords of Hellas is making quite a showing these days….) As a kid my brother always wanted me to play D&D with him. I would- but I didn’t really have a great grasp on the rules and, despite having a pretty good imagination, I had a hard time with the role-playing aspect. I still kind of do. Guess I’m just not destined to be an actor. Or an elf. So, enter Descent. In many ways it’s as if you’re playing a game like D&D but with a board, miniatures of the monsters, and cards with all the stats you need on them. Of course, a visual version of D&D isn’t all this game has to offer. 30 puzzle-cut interlocking board pieces. One side has outdoors/mountain artwork and the other is a dungeon/cave motif. Each piece is uniquely shaped and has unique artwork. Different play modes: Game Master or cooperative? 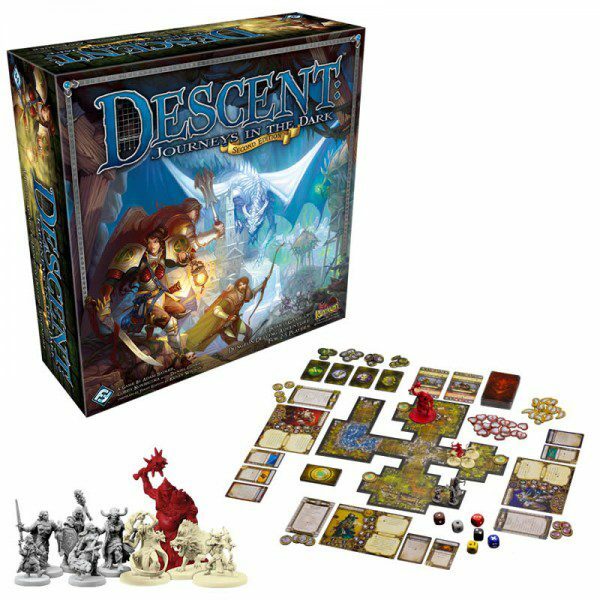 Out of the box you’ll need at least 2 players for Descent. That is, unless you have a tablet capable of running the companion app, Road to Legend. I’ll cover RtL in a moment- first let’s go over standard, app-less, play. As mentioned, you’ll need a minimum of two players- one to be the Game Master and control all the monsters, read the story, set the tiles, etc… and everyone else to be the heroes trying to defeat the evil horde the Game Mater controls. The core game includes one adventure and one full campaign but you can easily find more online, both official and fan-created. 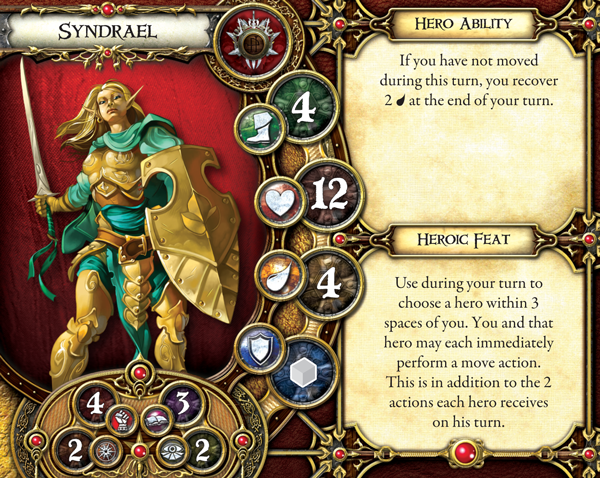 Regardless of if you’re playing a one-off adventure or a full campaign, players will choose their hero and then choose from the two possible classes for that hero. Classes change the hero’s base abilities and character type. For example, when you choose a ‘red’ character (Grisban the dwarf or Syndrael the warrior) you have the choice between the Berserker class or the Knight. Berserker characters do a ton of damage, can take a ton of damage, but also tend to be really slow and not very…. witty. Knights can bolster up or take damage for other heroes and have special attacks but they don’t tend to do as much damage when attacking. After choosing your character you take your starting cards from your chosen class deck and place them on the board. The board is made up of the afore-mentioned grided inter-locking pieces. One side usually has dungeon-esque artwork and the other side usually has forest or mountain artwork. The Game Master places his monsters on the board and… away you go! One of the other things I really love about this game is these board pieces. They are good, quality pieces and the different cuts and sizes mean you could easily write as many of your own adventures as you wanted and never use the same layout twice. 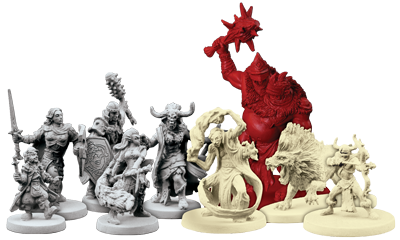 Once you’ve worn out the core game (and have $35-90 burning a hole in your pocket) you can check out some of many, MANY various expansions, add-ons, and lieutenant miniatures. 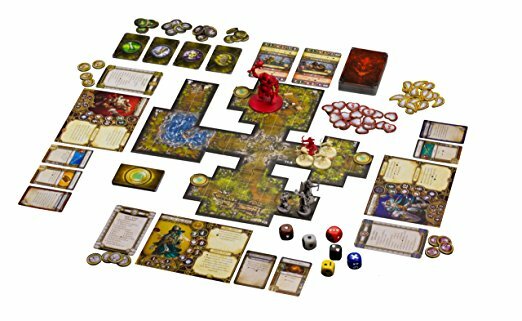 As of this writing there are 7 full expansions, 9 Heroes and Monsters collections (mini-expansions), 20 lieutenant miniatures (each of which comes with custom Game Master cards that change game play), and 3 co-op adventures that basically takes the place of the Game Master for a different play option. The introduction of Road to Legend totally changed this game for me. Suddenly, not only did we have a new campaign to play, but my wife and I could play a campaign over the course of a few weeks, with the iPad saving our game data, and the app playing the part of the Game Master. So cool. It’s a really slick app, too. Fairly simplistic in design, but the functionality is spot-on, the artwork is quality, the ambiance of the game (music, voice overs, sound effects), the works!… And it’s great for 1 player games! 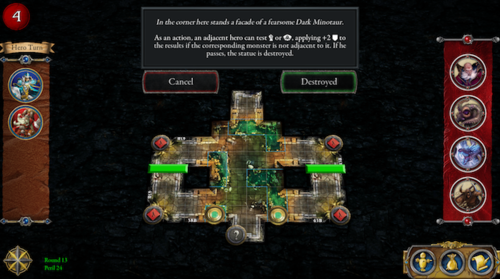 The app is free and it comes with a few one-off adventures and 1 campaign. If you want to change it up a little get the Sir Alric Farrow miniature piece. Another cool feature of the app is you can enter the various expansions and lieutenant figures you own and the game changes, depending on what you have. As of this writing Fantasy Flight has only released a few new 3-4 level adventures (no new campaigns) for the app, but I don’t have any of the expansions or anything and I know there’s more unlockables if you have physical expansion to use.